Long ago, more than 1,200 years in fact, the Sultan of Oman discovered a verdant island of coconuts and spices and became instantly enamored by its natural beauty. 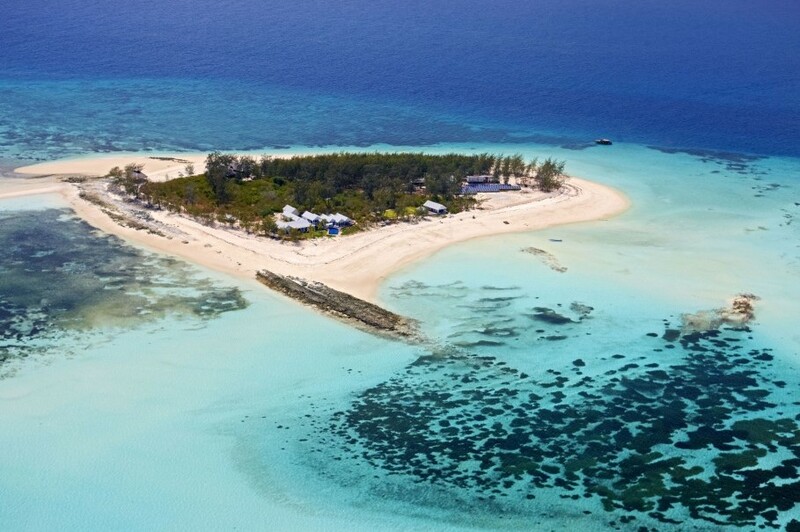 This island was Zayn Zal Barr, meaning ‘fair is the island’, now more commonly known as Zanzibar. It is in and around here that we discover a land so diverse in culture and bountifully blessed, we experience an eight-day adventure of enlightenment. In an age of travel where even the remotest destinations have become accessible, and the deepest of seas charted, luxury seekers occasionally require an extra helping hand to seek out something truly extraordinary. Thanda Island, located in the Shungimbili Marine Reserve, 80 miles south-west of Zanzibar, Tanzania, in the Indian Ocean, is that place. Founded by entrepreneurs Christin and Dan Olofsson, the largest private Swedish investors and philanthropists in Africa, Thanda is where magical experiences happen and holiday dreams come true. Far enough away from reality yet super-accessible (the island sports its own helipad) Thanda officially opened to guests at the end of last year, and is only available as an exclusive-use retreat, where a fortunate few will enjoy whale shark swimming and jet-skiing by day and haute-cuisine and Moroccan-style decadence by night. The main house, a striking east coast American revival villa, nestles elegantly in amongst eight hectares of towering coconut and banana trees, mangroves and vegetation. Two lovebirds have declared it their home and flutter about dreamily, a parrot sqwarks happily. Indeed, everybody on Thanda exudes pleasantness. Beautifully upholstered wooden sun loungers proudly surround the swimming pool, an ultra-sleek glass tank, which sits half above ground and half below. 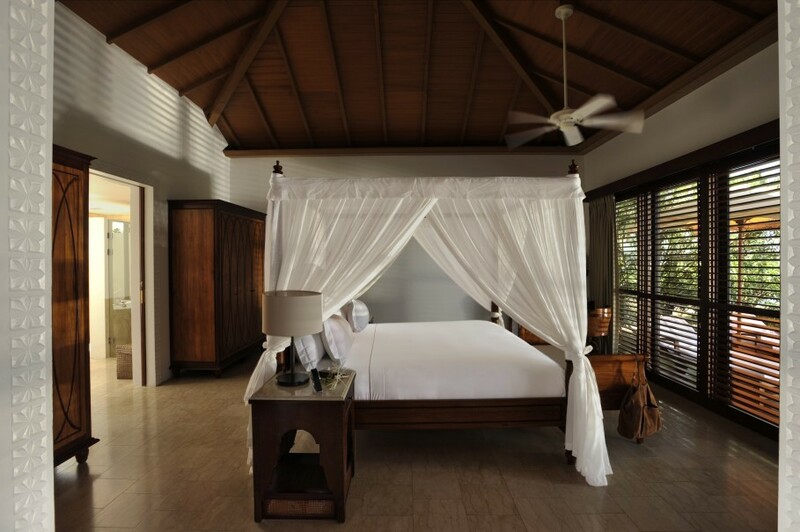 Five individual villa suites, located adjacent to the main living quarters, are elegantly decorated with chunky wooden four-poster beds, creamy pastel shades and solid writing desks. An external shower is a nice touch as the thermometer hovered at the 30C mark for the duration of our visit. The island’s beautiful hosts, Oscar and Antigone, will be in touch ahead of each group’s visit to discuss culinary and holiday preferences and to tailor the perfect stay. Everything is thoughtfully taken care of and reassuringly easy. On our first evening, we chomped away excitedly on sea bass fillets and tuna, caught that day, whilst sipping ice-chilled South African wine. Of course there is every activity imaginable awaiting the chosen few who will experience Thanda but it is the remarkable extent to which conservation and sustainability come into play here. An active project of commitment has been launched to safeguard the future of the coral reef. Sadly sea creature colonies have been diminishing for years, but Thanda is on a mission to reverse their fate. Sea turtles, dugongs, dolphins and whale sharks are all listed as either critically endangered or vulnerable to extinction. With the intelligence and careful guidance of the Tanzanian Marine Parks and Sea Sense, an NGO set up in 2001 to research and preserve threatened species, in the most part, by human negligence, two species of marine turtles – green and hawksbill - have recently happily returned to nest on Thanda. A desalination plant has been installed, carefully tucked away in a small coconut grove, and the island has various initiatives in place to support education and health on neighbouring Mafia Island. This is ecological tourism at its best, luxury with minimal impact. This place is seriously incredible and deserves a visit – just don’t forget your underwater camera. For those looking for an altogether more Western experience whilst still retaining east Africa’s immense charm, The Residence is a pleasant option. 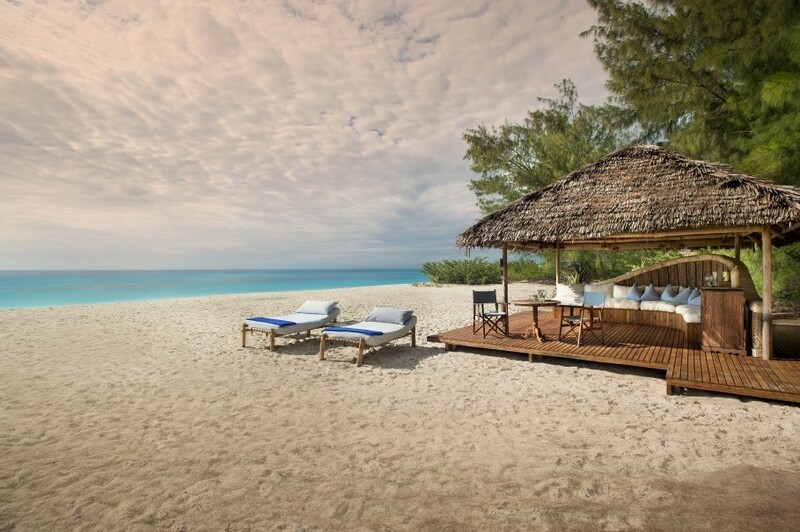 Nestled beautifully in 23 hectares of verdant gardens, located on Zanzibar’s south-west coast, the resort is undergoing an extensive refurbishment and boasts a team of well-trained, adorable staff with wide smiles, providing an attentive but relaxed service. Sixty-six villas fuse sleek contemporary elegance with the island’s European and Omani history. Our ocean front pool villa was extravagantly spacious, comprising a large living area with direct access to a small pool and deck area. A canopied four-poster bed was draped with billowing linen, the bed sheets crisp, plumped cotton. The resort has been cleverly designed to enjoy the glorious evening sunsets, which can be viewed from the main restaurant and lounge. During dinner, when a wine glass inadvertently falls and shatters on the tiled floor, Onza, the skilled food and beverage manager, is quick to act. Her otherworldly presence calms and, once again, tranquility is restored and all is fine on Zanzibar. We dine on an inventive menu, personally and lovingly introduced by the brilliant Indian head chef, who fuses international themes with local recipes and spices, whilst we munch away on Tanzanian fillet of beef. My visit to The Spa, a pleasant leisurely stroll from our villa, was really quite special. Six spacious individual treatment pavilions, a relaxation area, whirlpool, sauna and steam room captivates the senses and subdues the mind. After a quick personal quiz and selecting my preferred oil, my effervescent yet diminutive therapist, Helena, administered a powerful, deep rejuvenating massage in the privacy of a thatched pavilion. Total bliss. Flying from Pemba to Zanzibar on a single propeller Cessna Caravan high above the sparkling turquoise waters below is when we first spot magical Mnemba Island, a breathtakingly perfect heart-shaped atoll not more than a mile in circumference, surrounded by pearl-white sand so luminous it blinds us. Only a speedy 15 minute boat transfer from the north-eastern tip of Zanzibar, we’re welcomed by five smiley staff, waving enthusiastically from the island’s expansive golden beach. Luggage and shoes are abandoned while we wade through the balmy sea, knee high, to the main island cabin for a full debrief of how the island works. This is where to go to get away from it all, a true picture-postcard, all encompassing desert island experience, whilst refusing to give up on comfort, style and service, naturally. The extraordinary beauty of Mnemba makes it a popular honeymoon getaway but during our visit there were families, friends and couples enjoying the otherworldly island experience. Just twelve beautifully crafted bandas – or cabins - nestle harmoniously in amongst lush vegetation, each equipped with a generous en suite bathroom, ceiling fans, private bar and day beds. Closer to the cool, lapping ocean lies an impressive wooden chill-out, just for us, adorned with billowing cotton drapes and oversized cream cushions, providing welcome shade from the searing heat of the November sun. In-house therapist, Dayle, a gorgeously placid South African, ambles around the island tempting guests with an array of wellness treatments and massages, administered from the privacy of your own cabin. On our stroll to the water’s edge, cute coconut crabs go about their daily business, glaring up at us. We wade into the shallow sea, barely one minute from the shore, with just a snorkel, and observe some of the most incredible coral reefs imaginable. Fluorescent Bluefin trevally fish dart from one reef to the next. Once settled in our new abode, our personal butler enquires whether we would like to be woken during the night if an indigenous turtle decides to come and lay its eggs on the beach, a not irregular occurrence. We kindly turn him down and instead opt for a long, lazy dinner on the beach, a stone’s throw from our banda, where the music of the waves nudging the shore sends us off to bed sooner than planned. This feature was first published in Arabian Knight, January 2017. NINE is a private concierge club, providing tailored travel and lifestyle solutions to individuals and families globally. NINE’s expertise and knowledge extends to planning complex travel itineraries, restaurant & nightlife reservations, and sourcing impossible-to-find tickets, off-market private jets, unique gift experiences and pieces of artwork.